It's that time again when we remember the sacrifice and raw courage it took for a group of ministers and activists to subpoena the conscience of the nation and bring about meaningful change. 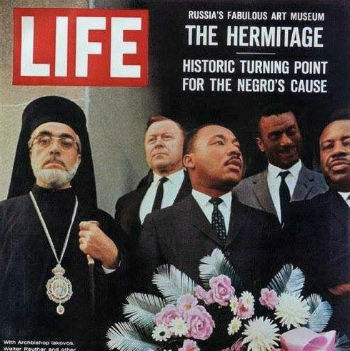 These pictures salute the head of the Greek Orthodox Church who came to Selma for that fateful march across the bridge in 1965. He was aware that marching with his flowing robes would make great media fare. This appearance was one of MLK's three cardinal principles that eventually created the climate for radical change. We'll discuss these as thedays wear on and we head to Feburary, Black History Month. 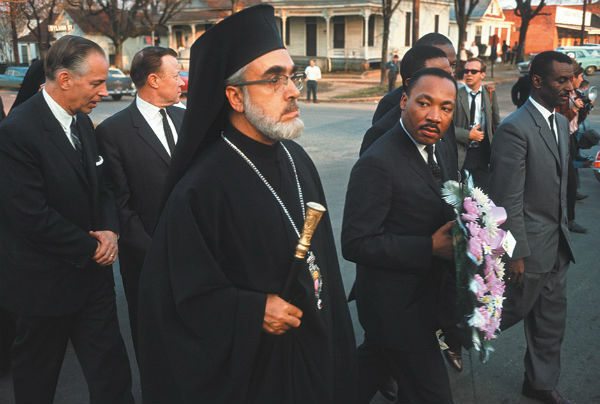 Archbishop Iakovos and Martin Luther King Jr. walk to the Dallas County Courthouse to hang a funeral wreath in honor of Reverend James Reeb, a civil rights activist who was beaten and killed by white segregationists, Selma, Alabama, March 1965. Photograph by Dan Budnik from his book Marching to the Freedom Dream.